In a perfect blend of art, science and fun, ocean conservationist and comic strip artist Jim Toomey is featuring the real life journey of Fillmore, a Green Sea tagged by a group from SeaTurtles.org and PRETOMA this past September off Costa Rica’s Cocos Island. Toomey hopes to connect hundreds of thousands of readers, young and old to conservation efforts led by SeaTurtles.org at the remote Cocos Island National Park offshore of Costa Rica. 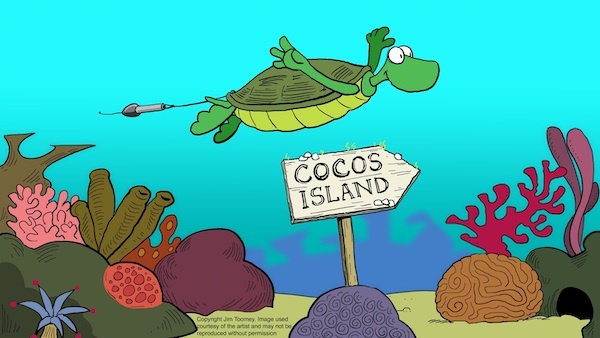 Fillmore the green sea turtle in the comic strip shares anecdotes on illegal fishing, coral reef ecology, and actual scuba-diving spots that the real sea turtle encounters during its meanderings at Cocos Island. Toomey has used Sherman’s Lagoon to promote awareness of ocean and shark conservation efforts and last partnered with SeaTurtle.org to raise awareness of sea turtles trapped in the BP oil spill in the Gulf of Mexico. Sign up today at www.seaturtles.org/fillmore to get daily updates about Fillmore’s wanderings, facts about the remote Cocos Island, and alerts about what you can do to help protect sea turtles and their habitat. And how about this for a Christmas Gift? You can even adopt a real sea turtle nest on a beach in Costa Rica under the protection of SeaTurtles.org’s partner project PRETOMA (www.pretoma.org). They also protect sharks and promote a pledge to eat seafood that is caught in ways that are safe to sea turtles. Fillmore will be featured at Cocos Island for the entire Thanksgiving week and for a few days afterward before he returns to his digs at Sherman’s Lagoon.